Nancy's Book Group at Scarsdale Library on Wednesday, April 17: Join Nancy at Scarsdale Library to discuss Just Kids by Patti Smith. Registration is required, please call the Reference desk at 722-1302 to register. Please note: The location is Mid Westchester JCC at 999 Wilmot Avenue. The program begins at 1:00PM. Click here for additional information. 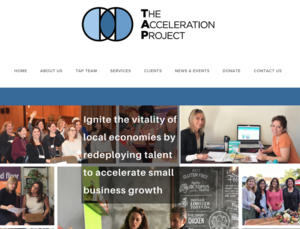 Scarsdale-based The Acceleration Project (TAP) continues to gain recognition for the important work it has done to revitalize local economies. Jane Veron, CEO, and co-founder of TAP, recently received the national Daily Point of Light Award for her outstanding service work, while TAP has just earned the Organizational Changemaker Award from the Nonprofit Westchester organization. Through strategic partnerships with organizations such as JPMorgan Chase and Goldman Sachs, TAP recently extended its reach nationally, serving those who would not otherwise be able to access high-quality business consulting services. Through its participation in small business conferences and special events across the U.S., it has established a presence in six states, and 30 cities and towns. Fittingly, Veron’s efforts to grow TAP’s size and scope have garnered recognition on the national stage. Veron, who also serves as a Scarsdale Village trustee and a trustee of the Scarsdale Foundation, co-founded TAP in 2012 to harness the talent of women who donate corporate-level business acumen to empower small businesses. The Daily Point of Light award is given each weekday by Points of Light, the world’s largest organization dedicated to volunteer service. Founded in 1990 by President George H.W. Bush to recognize individuals creating meaningful change in their communities, the organization grants the awards in both the United States and the United Kingdom. Veron spent her career in strategic planning and marketing for Fortune 500 companies, including working as a management consultant at Bain & Company, and a marketing executive at American Express. She also managed her own private consulting business. Today, she donates her skills to assist struggling small business owners, and recruit dozens of similarly qualified women professionals to do the same. Through TAP, volunteers proudly practice and broaden their skills, while smaller, often minority-owned, companies - and the communities where they’re located - benefit from solid, professional consulting advice. In addition to its work in cities such as Atlanta, Detroit and Philadelphia, TAP actively accelerates Westchester economies by providing strategic advisory services to numerous local clients, most notably women and minorities. It has worked with a myriad of organizations, ranging from restaurants and fine food retailers to health care service providers and nonprofits. Last month, TAP was named an “Organizational Changemaker” by Nonprofit Westchester (NPW), a group that provides the county’s nonprofits with a single unified voice for the work they do to support the economic vitality and sustainability within Westchester. In recognizing TAP’s efforts, Nonprofit Westchester cited its positive impacts in the community through innovation and creativity. The Acceleration Project (TAP) is a unique consulting firm that provides strategic and tactical advice to small businesses, entrepreneurs, municipalities and foundations. The nonprofit has served over 100 clients through its high-touch programs and impacted hundreds more through its large-scale projects. A 501c3 organization, it serves entities that would otherwise not be able to access consulting services of this caliber. TAP’s innovative model leverages the untapped potential of professionals to accelerate local economic development and provides a range of well-structured, accessible, results-oriented services to enable clients to grow and flourish. To learn more, visit theaccelerationproject.org.